Living with cockroaches exposes occupants of a home to dangerous diseases. Infestations can cause serious health problems, and people who have asthma or allergies suffer when cockroaches are present. Cockroach infestations can even cause asthma to develop in young children. 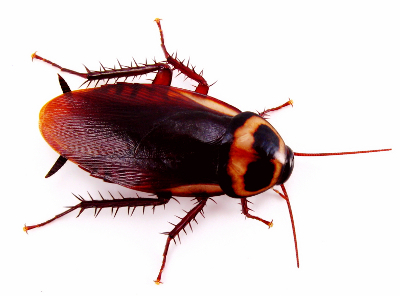 Venice Pest Control is experienced in providing high-quality cockroach control services for customers throughout Sarasota and Charlotte Counties. American cockroaches are large and brown or red in color. These insects secrete a liquid when feeding, and it is possible for humans to accidentally ingest this secretion when cockroach activity goes undetected. American cockroaches are mostly found in moist shady areas outdoors, but will wander indoors for food and water. They often enter structures by flying or crawling via plumbing, sewers, or by trees and shrubs located next to buildings or branches overhanging onto roofs. The American cockroach, often called water bug or palmetto bug, is the largest type of cockroach in Florida. The insect is known to secrete a foul-smelling liquid when disturbed. German cockroaches are known to carry organisms throughout a building that can cause illness in humans. Allergic reactions are common when infestations are present, and German cockroaches can even cause damage to fabrics and books when feeding on these items. There have been reports of people being bitten by German cockroaches. Venice Pest Control is dedicated to providing honest, dependable pest control services to every customer. We pride ourselves on eliminating cockroach infestations before they cause serious health problems. Our 40 years of experience and knowledgeable professionals are just a phone call away. Contact us for more information or to schedule an appointment for efficient extermination services.